I call it the Tea necklace because the two main charms are a teapot and a teacup. The third charm is a heart. As seen in the photos, it is in excellent pre-owned condition. It is 17" long, weighs 2.4g and is marked Au750(18K). Everything is solid 18k yellow gold including the chain, the cup, and the Virgin Mary charm. The chain is from Italy and both chain and pendant are stamped 750 and 18k, everything has been professionally tested by jeweler for purity. Condition is Pre-owned. Chain is marked '750'. There is other writing on the clasp/chain, but I can't read it. I don't know what kind of chain it is, but its very reflective to light and beautiful. Ending May 3 at 2:53PM PDT7d 23hMetal: Yellow GoldLength: 18 - 19.99"
It is 3mm thick, and 7.8 grams is the wieght. It has 18k written on it in multiple ways in Arabic and Hebrew. This is done because the jeweler in Syria added the claw clip at 585/14k(also tested) for free, for a faster, less bendable and more dependable close/open. 18k Solid Gold Filigree Flower Pendant with 18k Chain - 11.2 Grams - Nice!! Great Condition, chain and pendant together weights 11.2 grams. Really nice! 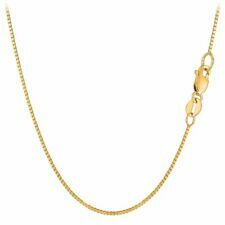 Chain - beautiful chain; 22", 18k gold; 7g; solid construction. All Diamond and Gemstone weights are approximate. Gemstone colors can vary slightly depending on the settings of your computer monitor. 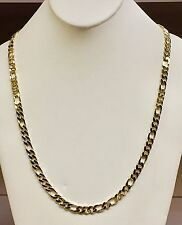 SOLID 18K GOLD 30” LONG HERRINGBONE FLAT CHAIN NECKLACE. In great pre-owned condition. Like most herringbone flat chains it has slight bents which are not really noticeable. It is a high quality necklace and it’s stamped “18K ITALY 750 MMI”. New Listing18 k Solid Gold Chain 7.7 Grams Beautiful Diamond Cut! 25"
18 k Solid Gold Chain 24". Beautiful Diamond Cut! 7. 7 Grams. #1 Best Seller - Genuine 18k Gold - Top Rated eBayer! 18K Solid Yellow Gold. Box Chain Necklace. Lobster Clasp for secure fit. It is a high quality necklace and it’s stamped “18KT 750 ITALY MILOR”. In great pre-owned condition. Like most herringbone flat chains it has slight bents which are not really noticeable. weight: 3.2 grams of solid pure 18k gold. 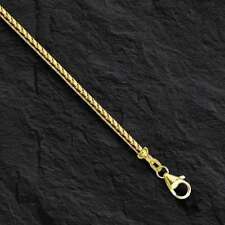 This heavy solid 18k gold chain is 24" long. Wear it with or without your favorite pendant. It is 1.8mm square. It will stand alone. Closes with a strong lobster claw clasp. The 18k gold weight is 21.8 grams. 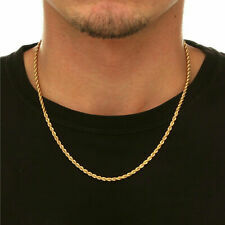 18k 750 Solid Gold Chain Necklace 28” 21 Grams. Condition is Pre-owned. Shipped with USPS Priority Mail Flat Rate Envelope. Metal: Yellow GoldStyle: ChainLength: 24 - 29.99"
18K SOLID GOLD ROPE CHAIN 2MM (2.40 Gms to 4.15 Gms).. NEW!! 750 18k Gold Chain. 18k solid gold (Stamped 750 - UNO-A-ERRE). 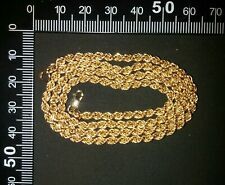 Solid 18k gold chain in excellent condition. Weighs 10.2 grams. 2.0mm wide. 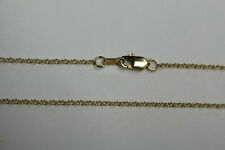 Here we have a rare solid 18k gold John Hardy wheat chain necklace, 18" long and 6.5mm wide. This is a heavy necklace weighing over 96 grams! I can include a John Hardy box or pouch if requested. Product Information Metal: 18k Solid Yellow Gold ( 750Stamped) Length: 20 inches Total Weight: 11.51 grams. Thickness: 2.5mm Lock: Security Clasp Made in Italy. We're going to ship at the same day of your purchase after clear payment. There are an Additional Tax for CA Residence. Please email us if you have any questions. Thanks for your purchase! Condition is Pre-owned. Mint condition. WIDE 3.30mm. THICK 71.80gr. FROM ITALY. THE MAINER LINKS HAVE A LIGHT BRUSHED FINISH. THE CONNECTING LINKS ARE 2.13mm. WIDE AND SOLDERED CLOSED. THE SPRING RING CLASP IS 7mm. THERE IS A SMALL PLAQUE THAT IS STAMPED 750 AND MAKERS MARK. 18k solid gold chain necklace Lobster claw Clasp. Condition is New with tags. Shipped with USPS First Class Package. CLASSY! 18K 2 Tone Solid Gold 5.0mm 17" Hugs and Kisses Chain, 11.9 Grams! 18 Karat 2 Tone Solid Gold 5.0mm 17" Hugs and Kisses Chain, 11.9 Grams! This would be perfect for any jewelry collection. Balestra Giovanni & Figli 750 18K Solid Gold Long Italian Box Chain Necklace 20"
AUTHENTIC BALESTRA GIOVANNI & FIGLI 18K SOLID GOLD LONG CHAIN LINK NECKLACE. TOP QUALITY 18K YELLOW GOLD ITALIAN BALESTRA GIOVANNI & FIGLI NECKLACE . NECKLACE IS STAMPED AND LASERED FOR 18K GOLD. CHAIN IS 1.5MM THICK. This gold chain is in great condition and would be a great investment! Length: 21 inches Karat: 18k-19k Country of Origination: Iranian This deal will not last through the holidays! This would be the perfect gift for somebody you love! 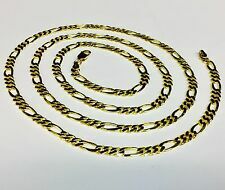 18K SOLID GOLD 0.60MM ROLLO/CABLE CHAIN (1.78 GRAMS) 45 CMS ....NEW!!! FULL WEIGHT OF THIS JEWELRY IS 18K GOLD. NOT PLATED OR FILLED. IT IS 18K GOLD. RING CLASP. 1.78 GRAMS. WEIGHT OF EACH CHAIN ROLLO/CABLE CHAIN. "750" HALLMARK ON THE CHAIN. 18 k Solid Gold Chain 7.7 Grams Beautiful Diamond Cut! 25"